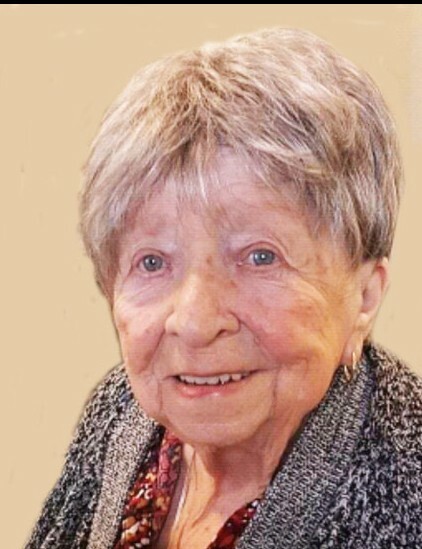 On the morning of February 8, 2019, at 91 years young, Heaven gained a new angel. With heavy hearts we had to say good-bye to our mom, Marian Nielson. Born in Annabelle, Utah December 20, 1927, daughter of Dell and Arvilla Roberts. Wife of E. Reed Nielson, deceased. Mother to Kathy Burt (deceased), Karyn Johnson (deceased), Debbie (Dennis) Brimhall and Diana Caldwell. Grandma to 8 grandkids, 16 great-grandkids and one great-great-grandson. Friends may call at Goff Mortuary, 8090 So. State, Midvale, Monday, February 11, from 6-8 p.m. Graveside service at 1 p.m. Tuesday, February 12, in the Elsinore City Cemetery, Elsinore, Utah. Marian Nielson, my mom, was always so positive, loving, happy, tough, resilient, helpful, funny, friendly, creative and the list goes on and on. We lost a wonderful person. I know she is being loved and reunited on the other side. Thank you for being my mom. I will always love you. Thank you to Sandy Health and Rehab for the wonderful care everyone gave our mother. Also, Thank you to Onecare Hospice for the wonderful care and compassion. We are truly grateful to all the caregivers. I don’t know anyone who has learned more lessons in life than Mom’s family. She is one of God’s “silent teachers,” teaching us all something all the time whether we knew it or not. She truly never said an unkind word about, or, to anyone. As a little girl, I used to giggle when she would tell me “think positive.” I’m telling you now I would never laugh at that again. Her strong spirit, will to live to 91, laugh and love was undefeatable. She loved her grands & great grands (& her little great, great grand) so very much. Her eyes would always light up when they came to visit. She stepped right into the arms of daddy that she has missed so much for 30 years. I’m sure they are both in Wendover right now having a blast! (or just cloud hopping). We love you so much and will miss that “I love you” every time we went to see you. Have fun in your new adventure mom! We have been truly blessed with the love & care mom received at Sandy Regional & Rehab where she spent the last years of her life. The WHOLE staff is superb and Diana & I (and mom) love and respect you all for the hard work you have done and will continue to do, Thanks again.